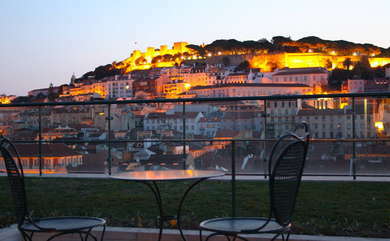 The smart Hotel do Chiado occupies a prime spot in Lisbon's historic downtown and is within walking distance of most of the city's biggest tourist draws. The hotel has plenty of stories to tell--it sits on the top two floors of an upmarket mall, formally the famous Armazéns do Chiado department store--renowned as the most elegant department store in Portugal before it was destroyed by a fire in 1988. 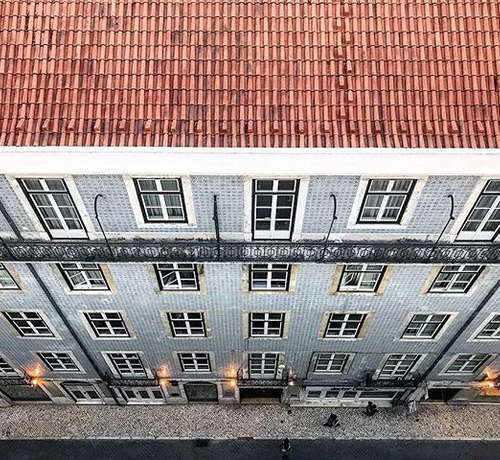 The building was painstakingly restored by the architect Siza Vieira some years later, and Hotel do Chiado is now famous for the stunning views from its terrace bar, Entretanto. Views from the hotel's rooms and suites have some of the best panoramic views in town--guests can see the castle, river and many other landmark buildings from the rooms' terraces and balconies. Public areas also have terrific views, and the 7th-floor bar attracts a fashionable crowd for sunset drinks. The buffet breakfast (included in room rate) is a huge spread, with any number of hot and cold options. Shopping, sightseeing, eating and drinking area all close at hand, and a metro station right beneath the building makes it easy to reach the airport and farther-flung areas of the city. YOU SHOULD KNOW Local popularity means it can be hard to find a seat on the terrace of Entretant bar during the summer high season, but guests get a 10 per cent discount. Rooms are decorated in a classic yet contemporary style, with muted colors and a minimalist feel. The cheapest rooms lack views, but stepping up a price range brings small French balconies and terrific views over the shopping streets and landmarks such as the castle and cathedral. Suites have living rooms, larger balconies, and the most impressive views. Free in-room Wi-Fi, flat-screen TVs, and mini-bars are standard in all rooms. The spick and span bathrooms have tubs, complimentary toiletries, robes, and slippers. Public spaces have floor to ceiling windows, making the most of those terrific view. Reception is open 24 hours. YOU SHOULD KNOW The lobby is perfectly functional, but not particularly cozy or exciting. The breakfast spread is laid out in a stylishly-appointed dining room, with plenty of natural light, but the really spectacular views can be appreciated from Entretanto, the bar-restaurant that is often cited as one of the best spots in town for drinking and dining with a view. YOU SHOULD KNOW The menu is more salads, sandwiches and light meals than high gastronomy, but it's perfectly palatable, and the mouthwatering views make it worth the rather inflated prices. The terrace bar is in demand with chic locals as well as hotel guests and has a vast menu of cocktails, wines, and spirits as well as teas, coffees, and soft drinks. 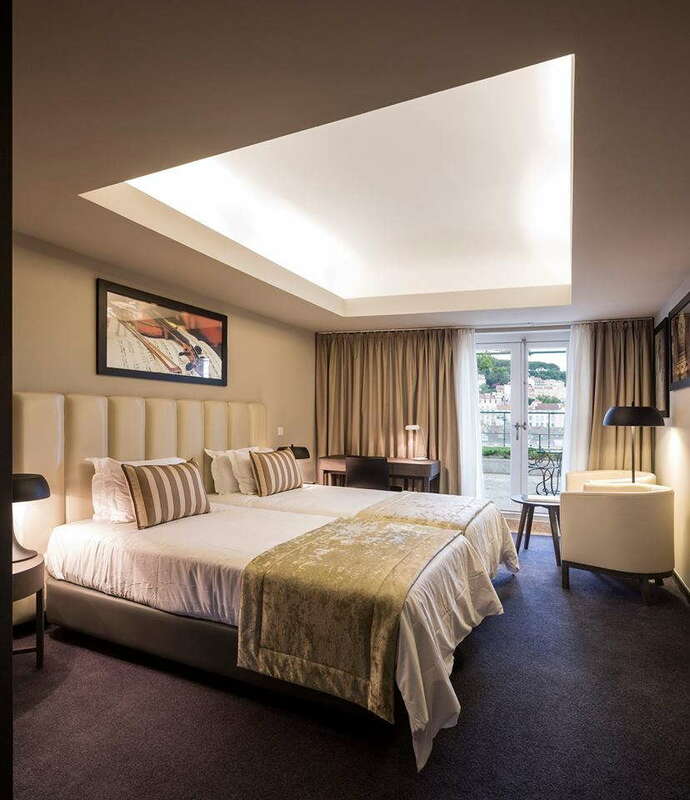 Hotel do Chiado is located in the historic downtown neighborhood of Chiado/Baixa, and is within easy walking distance of major squares and shopping streets such as Rossio and Praça do Comércio, as well as the busy nightlife of Bairro Alto. The old yellow trams rattle along the streets nearby, the hotel is moments away from the Baixa/Chiado metro, and there is a taxi rank next to the building. Sights such as the castle and cathedral are less than a mile away, and can be reached on foot, by taxi or tuk-tuk. Trains for Sintra leave from nearby Rossio station, while those for Cascais leave from Cais do Sodre, less than 10 minutes' walk from the hotel. The famous Time Out Market (10-15 minute walk), with its collection of gastronomic delights gathered in a communal food hall, has become one of Lisbon's biggest tourist draws, and visitors here can try everything from superior ice cream to ceviche and cured ham at miniature versions of some of the city's top restaurants. Bairro do Avillez (7-10 minute walk) is a 2016 opening from Portugal's best-regarded chef, Jose Avillez, and is a 'mini neighborhood' with formal restaurant, informal tavern, and a gourmet store. The buzzing Bairro Alto is close to the hotel--don't miss Artis (10-minute walk), where a largely local crowd gathers to sip wine and socialize. During the summer, Topo Chiado (10-minute walk) is a lovely place to come for outdoor cocktail drinking, with DJs spinning tunes and bar staff taking their time to create delicious drinks (they really do take their time, expect to queue for a while). Views of the Santa Justa lift add to the experience. 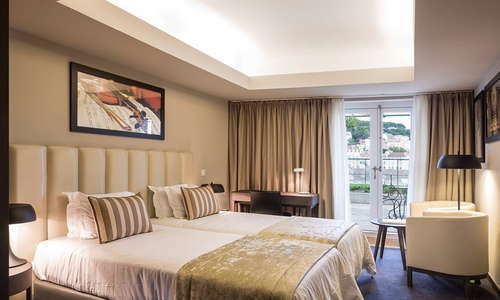 This hotel scores major brownie points for its terrific location close to Lisbon's sightseeing, shopping and nightlife action. The magnificent views and hip terrace bar-restaurant are additional points in its favour. The hotel and its rooms are well-appointed, and the service is friendly. The hotel's transport links are probably the best in the city, and it's a short walk to the recently-revamped waterfront as well as the lively Bairro Alto bars. Despite its central location, street noise is minimal.